Having fun playing music that we love. 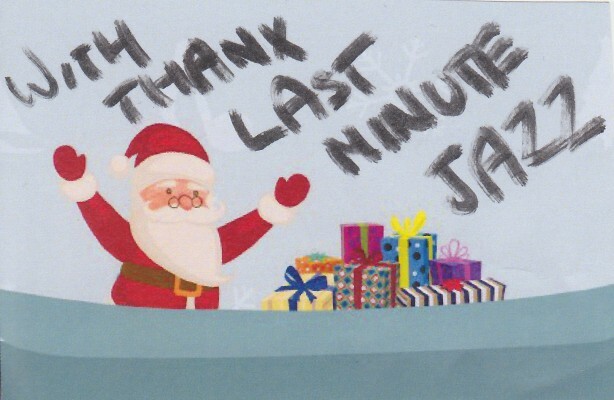 Last Minute Jazz is a small Canberra-based jazz band that serves as a way for a group of friends to get together and play the music that we love. The band started in 2007 when Bran & Stephen, who organised an ad-hoc band each year for a local Arts and Crafts Show were asked what their band name was. After a lot of bad ideas, the name Last Minute Jazz was proposed and it's been used for the band ever since. It's also quite appropriate given the sometimes last minute organisation some of our gigs involve. The ad-hoc nature of the band has never changed, and between 2007 and 2011 the band featured many different players with occasional gigs here and there. 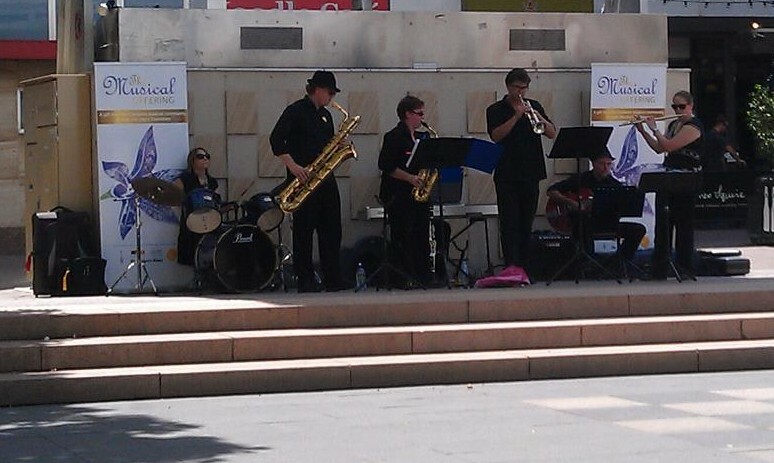 The band really took off in 2012 when the number of gigs increased, which saw us playing for a number of private events, at locations that include Old Parliament House, the National Hockey Centre in Lyneham, and down in Royalla Estate. After a successful year in 2012, 2013 started with a couple of gigs within the first few months, with the highlights including a public performance in Garema Place on Australia Day for The Musical Offering, a community mingle event at the Franklin Charity House, and entertaining the congregation at the Tuggeranong Baptist Church by filling in for the worship band. The band then travelled down to Merimbula in June for the Merimbula Jazz Festival, which was a great success, even though we had a fill-in piano player since Bran was unable to attend that weekend. (Thanks Beth!) Following up from the Jazz Festival, the band flexed it's musical skills by helping out a local Jazz student with her course recordings in September. The year finished by style, and Christmas spirit, when LMJ provided the pre-show entertainment at a Community Christmas event in Belconnen, followed shortly by an informal gig at Tuggeranong Baptist Church as part of the end of year and Christmas celebrations. Beth (Flute/Piano) slots nicely into the band whenever she joins us for a gig or rehearsal, filling in for Bran on piano, or playing her flute either duelling with Heather, or making a fantastic sound on her own. Heather (Flute/Sax) adds a unique sound to LMJ when she plays her flute, and amazingly she manages to make herself heard whole soloing over the drums, piano, and guitar without needing a mic. Jesse (Trumpet) with his smooth and relaxed tones is a welcome addition to the existing LMJ line-up. Already an experienced trumpeter with two of Canberra's premier big bands, Jesse's laid back groove adds a new dimension to the LMJ horn section. Leanne (Trombone) adds the lovely full and low sound only a trombone can create into the band, whenever she joins us. It's always great to have the sound of the trombone filling in the backing parts and adding a new flavour to the sound that is often lacking in small bands. Nick (Bass) provides a rich sound on his electric bass, be it joining with the drums in bringing in the rest of the band at the start of a chart, or effortlessly keeping a constant beat under the chaos of the horn section having too much fun. Rick (Guitar) fits in perfectly with the rest of the rhythm section by providing the much-needed chords that give the band a really big sound when required. Add a solo or two, and you've a great sound to listen to for the whole gig. Who are Last Minute Jazz? Bran (Piano/Brass) is the loudest member of the band, not only when he plays his trumpet, or piano, but even when he talks (which is double tempo too!). His musical talent is impressive, and he can play any instrument you put in front of him... except for woodwind! Jess (Sax/Clarinet) fills in the gap left by Bran by being able to play most instruments from the the woodwind family. Her ability to move her fingers across her Saxophone is a thing of wonder as she hammers out awesome solos consistently. Robyn (Drums) meets the essential need of every band by being a flexible and enthusiastic drummer. She gets into the groove, and her hits are perfectly timed to create the right atmosphere for each chart. Without her, this band ain't got that swing! Jen & Sarah were thrown into the deep end at TBC when they led the congregation in singing with the band. Needless to say they passed the test with flying colours, proving their ability to sing confidently with a band that usually just makes it up as they go along. lastminutejazz.net is maintained by Stephen Rees-Carter. All media and content, unless otherwise specified, is © 2007-2016 Last Minute Jazz.